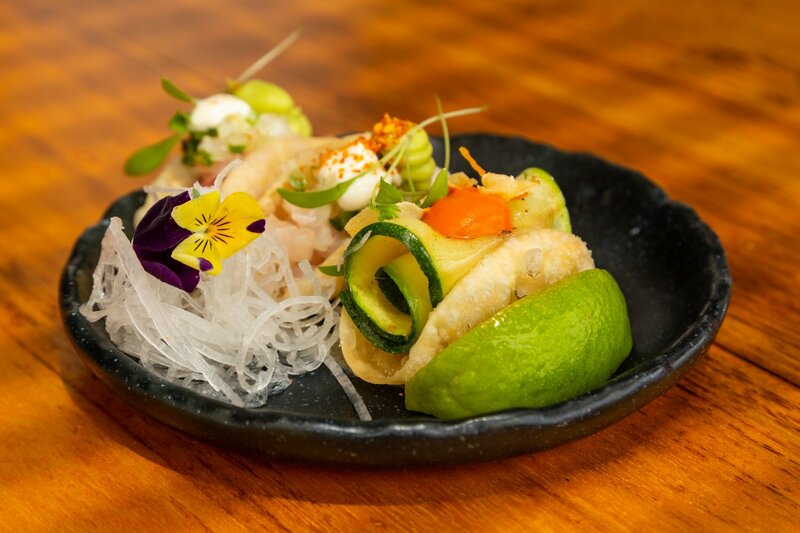 Nobu's delicious fusion cuisine has helped make it an international phenomenon and its Ibiza outpost is no exception. The Ibiza gastronomic scene has been developing dramatically over the past decade too and now one of the hottest tickets for dining enthusiasts is Nobu restaurant sited within the Nobu Hotel Ibiza Bay. The restaurant is proving very popular with evening table reservations almost all booked for summer 2018, though fear not as those that want to try the delicious fusion cuisine of this international phenomenon should try for a table at lunch time. At midday Nobu Ibiza Bay offers a set menu, with a choice of three courses for a fixed price of €40, or a pared down version of the evening menu, including a selection of its classic dishes. We were lucky to be treated to a variety of the lunch dishes, complemented by a trio of very original cocktails. Sure it can be tough to get away from the beach in the middle of the day. But, from its exclusive position beside the beach of Talamanca, with its relaxing views of the boats at anchor in the bay, it is difficult to think of a better location on Ibiza to enjoy lunch with friends or family. To the food: appetisers of padron peppers with a miso dipping sauce made a uniquely satisfying variation of a very old favourite. A perfect example of how Nobu manages to elicit an incredible amount of flavour from a simple dish was the spinach salad with parmesan, dry miso, truffle oil, yuzu and olive oil. It was pleasantly salty and with a nice aroma of truffle, yet light on the palate. The white fish dry miso, with sea bass cured in olive oil, was a delight to behold, as well as to share, and the ensuing chopsticks battle to win the final piece was testament to its allure. Nobu has perfected the art of simple, quick meal bowls which burst with flavour and two of these appear on the lunchtime menu. We all loved the tuna poke bowl with a raw mix of tuna, salad and vegetables which, when stirred together with the miso mayonaise, combined to produce a deliciously healthy main course. The anticucho donburi, with spicy beef, ginger and chives cooked, Peruvian style on skewers, was the perfect alternative for meat lovers. Inevitably, Nobu excels at amazing sushi. We sampled three of its finest offerings; a perfect tuna nigiri with smooth, almost creamy, rice, a crispy, rock shrimp and asparagus nigiri and soft shell crab maki roll, wrapped in daikon. All were superb examples of the art – finely crafted, traditional and delicious. An Ibiza Spotlight recommendation is the classic "Bento Box" which, for €36, contains a journey through the very best Nobu has to offer. Starting with the cold sashimi salad, you can work your way through some rock shrimp tempura, a portion of the legendary black cod which is marinaded for three days in salty-sweet miso and falls apart into very tasty flakes, then onto six of the super-smooth maki rolls, before washing it all down with a bowl of hot miso broth. This truly is a complete meal, ideal to be eaten while relaxing on one of the Nobu day beds in front of the sea (check for availability) or taken to the beach to picnic on the sand. The Nobu cocktail list was devised in New York City, with distinct Japanese influences. We tend to favour dry cocktails and the Matsuhisa Martini, a super dry blend of vodka and sake shaken with pickled ginger and cucumber (a favourite of co-owner Robert De Niro), really hit the spot. At the other end of the scale, the "English Rose", a sweet combination of gin, citrus berries, chartreuse and Lime juice was a fruity, summery alternative. However, the undisputed king went to the jalapeño and ginger martini with basil leaves and a touch of citrus. This could well be my favourite cocktail ever - it just keeps getting hotter and hotter the deeper into it you go. The restaurant makes a perfect lunch location for boat owners anchored in the calm, shallow waters of Talamanca Bay. A service is available to bring you ashore or with 24-hour advance booking, Nobu will happily deliver an order to your boat. Lunch at Nobu restaurant makes a great introduction to the finest Japanese cuisine, where afterwards, you can lounge by the pool and finish in a plush paradise - book your table today at this great spot. And for the ultimate Nobu experience book your stay at the Nobu Hotel Ibiza Bay.